This “Bellissima” work of art radiates the beautiful natural Yellow colors of the sun. I could not resist painting this wonder of nature that was in a pot under a tree thriving with just the right amount of light. After I created the original pastel painting I also created two Archival Digital Fine Art works of art on heavy cotton paper and lovingly embellished by hand both with pastel to give this intense sparkling yellow sunlight hue that replicas the original pastel painting. Although, there were two I created them separately so that each would be slightly different and have their own originality. They are truly incredible works of art. This art is protected from the UV rays and with non glare pure vision Museum Glass. The frame is sheets of gold leaf one after the other all around the frame with a beautiful finish. This work of art measures 23” X 18” only two were created one is left. Each one has its own Certificate of Authenticity. If at any time you would like more information about this piece of art contact me. All throughout the day just as the original “Bellissima” pastel painting its with layers pastel yellows continuously change with the light of the day. Just like the original this “Bellissima” Gold Leaf Framed Archival Digital Fine Art has that same effect! I first saw this voluptuous Orchid handing under a low canopy of an avocado tree. I was mesmerized by its natural beauty and size that reached the height of 10 1/2″. The shade cast from the tree covered the plants and grass beneath it like a heavy blanket, muting all color to a dull tone. The one flower immune to this effect was this Cattleya Orchid radiating from under the tree like a morning sunrise. The Yellow was so bright I saw it from a block away and just kept walking towards it and just had to create a painting of nature’s beauty. 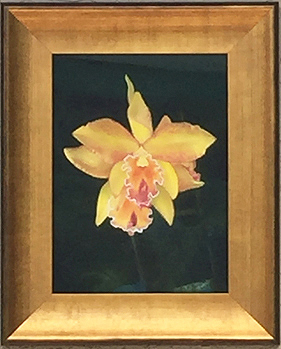 I created two of these “Bellissima” Gold Leaf Framed on heavy cotton paper, Archival Digital Fine Art, one for an exhibition at the Agora Gallery in New York City and an exhibit at Neiman Marcus Fort Lauderdale during their Trend Event and Artist Showing. This is the second and last unique piece with this frame.